Fresh Fruit Delivered to Your Office or Apartment Building! 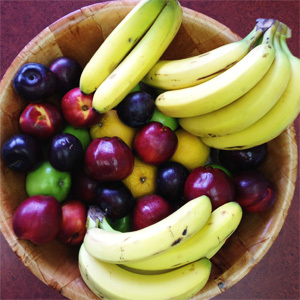 We will come to your site to educate your employees about the benefits of eating fruit! Who knew that eating an apple is a more reliable method of staying awake than consuming a cup of coffee? Or that a banana has four times the protein, three times the phosphorus, and five times the vitamin A and iron than an apple. We will teach you the health benefits of fruits and why an apple a day keeps the doctor away! Each bowl includes a variety of hand-sorted fruit to ensure top quality for every delivery. Oranges, apples, and bananas, as well as local seasonal fruit will be provided when available such as peaches, pears, and nectarines. Fruit that is not available locally is sourced from farms in the USA. The exception to this is bananas because they are a tropical fruit.